Many fine surfactant scientists around the world have kindly given their help and support. In particular, the excellent team at U. Sofia in Bulgaria have been immensely helpful in providing explanations and algorithms. Specific assistance from these experts (in academia and industry) is explicitly acknowledged on the relevant pages. Your customers are greatly in need of sound formulation advice. To say that your surfactant is "a great all-round hydrophilic surfactant" is not providing much assistance to your customers. If, instead, you said "it has a Cc of -1.2, a MWt of 365, an L of 20Å, an A of 60Å² and a ξ (with an oil like decane) of 70Å" then your customers could immediately know how to start to formulate with it. Cc is easily measured, L and A are easily estimated and ξ can, with some effort, be extracted from phase volumes. If you can add a temperature coefficient as well that would be wonderful. As you probably have in-house high throughput (robotic) techniques gathering these data should be routine. And checking Cc values of each batch is a wonderful, quick, QC technique. Each production batch has different alkyl chain length distributions in the raw materials, and EO lengths can vary from batch to batch. By measuring the Cc and, if necessary, adding some high or low Cc component to bring it into spec, you will be able to deliver the same surfactancy every time. Of course the information of some of your best surfactants for specialist applications (such as EOR) should be kept confidential, but there is no reason for not supplying it for your general-purpose surfactants. If your technical support staff are used to HLD-NAC, and if they know the key values of their surfactants plus the EACNs of the customer's oil, then troubleshooting a problem will be much more efficient. With the HLD-NAC app on their iPad or PC they can even do the calculations on the fly. Your customers will be able to formulate much more effectively if they know the EACN of the oils you are supplying. And because many of your oils will be (rightly!) impure mixtures, by measuring (and, if necessary, tweaking) the EACN of each batch you can be sure that your customers will experience consistent formulation results. It is a tragedy that so many surfactant papers are of so little use to practical formulators. This is because the data they provide in terms of their specific combination of salt, temperature and oil can rarely be translated to a similar situation that might be relevant to an end-user. However, if all academic papers listed the Cc of the surfactant(s) and EACN of the oil(s) it then becomes trivial for the end-user to translate those data to their own specific formulation. First, insist that your suppliers provide you with the necessary information on Cc (etc.) for the surfactants, EACN for the oils and any other information (such as salt concentrations in ingredients) that might affect HLD-NAC. Second, use the apps here routinely to help you navigate around surfactant space and formulate more efficiently. 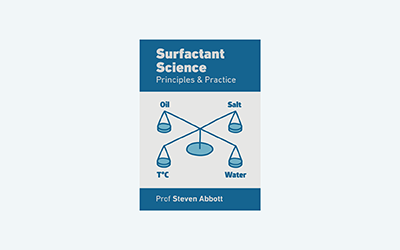 Third, let us know of problems, issues, criticisms, data that could help us continue the development of the theory and update future editions of Practical Surfactants.